The 100th day of school was marked with substance to enhance the traditional celebrations throughout the JEC Lower School this Monday. In a bid to engage students on a more meaningful level than merely counting days, the second grade spent time writing chesed notes and words of encouragement, often to themselves on how they can step up and improve their world and the lives of others. The notes were then adhered to 100 helium filled balloons, which the grade then released in unison. 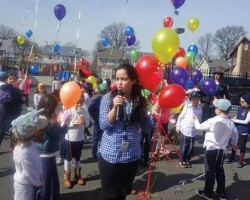 The entire JEC Lower School joined the second graders in the courtyard to witness the colorful spectacle, which was followed by a medley of Chodesh Adar songs and dance.